In the High School the students have been working hard on All-County Auditions. The following students prepared and recorded themselves singing an audition piece individually in the HS Music Recording Studio for the All-County Ensembles performing at The Eastman School of Music in March: Alec Bhaskaran, Raelynn Bovenzi, Molly Connors, Tony Ennis, Brooke Erion, Jacob Fox, Taylor French, Seamus Gillis, Aidan Goold, Riley Goold, Evie Manchester, Audrey Natale, Gabby Patchett, Ella Peters, Sydney Picciotti, Melissa Price, Megan Reinke, Will Tomaszewski, Leah Torregiano, Owen West, and Kaitlyn Yelencsics. High School chorus students (25!) recently participated in the Vocal Solo Festival in Brighton. They went to Brighton High School on Saturday January 5th to sing prepared solos and duets for Monroe County Music Educators Association Judges. Participation was high, scores were impressive and judges comments were positive and productive: Tucker Beckett, Alec Bhaskaran, Raelynn Bovenzi, Nevaeh Close, Molly Connors, Hannah Coria, Tony Ennis, Brooke Erion, Taylor French, Seamus Gillis, Aidan Goold, Riley Goold, Christine Halfmann, Evie Manchester, Audrey Natale, Ella Peters, Melissa Price, Megan Reinke, Sarah Robles, Ginny Roth, Will Tomaszewski, Leah Torregiano, Owen West, Kaitlyn Yelencsics. 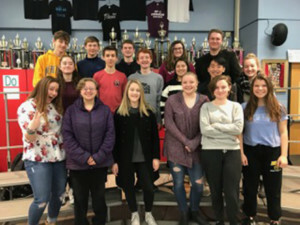 The following high school instrumentalists recently participated in Solo Festivals at Brighton High School (jazz) and Fairport’s Minerva Deland School: Daniel Atkinson (jazz & classical), Anna Carter, Molly Connors, Tehya Deisenroth, Jaima DeWitt, Matt Dobner, Seamus Gillis, Leah Greenich, Olivia Hullihen, Avery McLaughlin, Audrey Natale, Reese Perkins, Melissa Price, Will Tomaszewski, Mary Vullo. These students prepared solos on their individual instruments and played their audition pieces for Monroe County Music Educators Association Judges. Congratulations to all of these HF-L musicians!